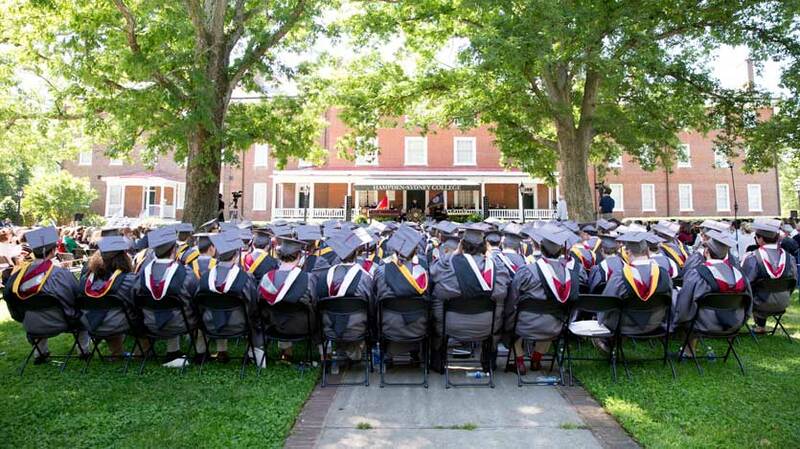 On Sunday, May 14, Hampden-Sydney College celebrated Commencement marking the conclusion of the College's 242nd year. 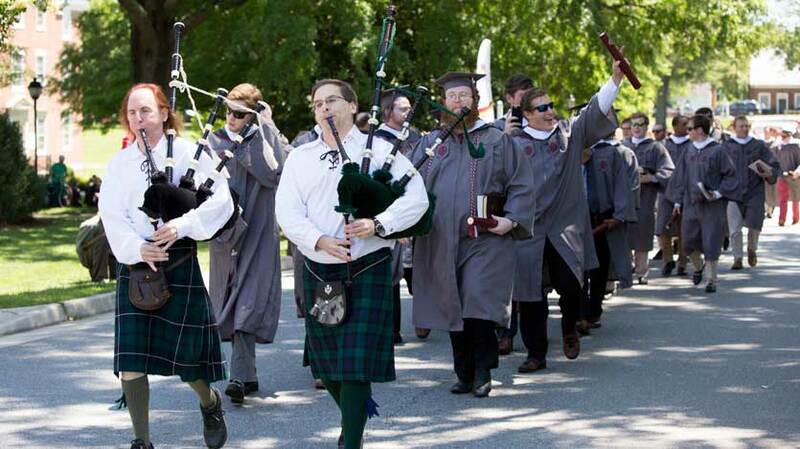 Parents and friends gathered to watch the 202 graduates walk across Venable Lawn and receive their diplomas. After an introduction by President Larry Stimpert, James Hua Lau gave the valedictory address, a distinction he earned with a 3.9931 grade point average. 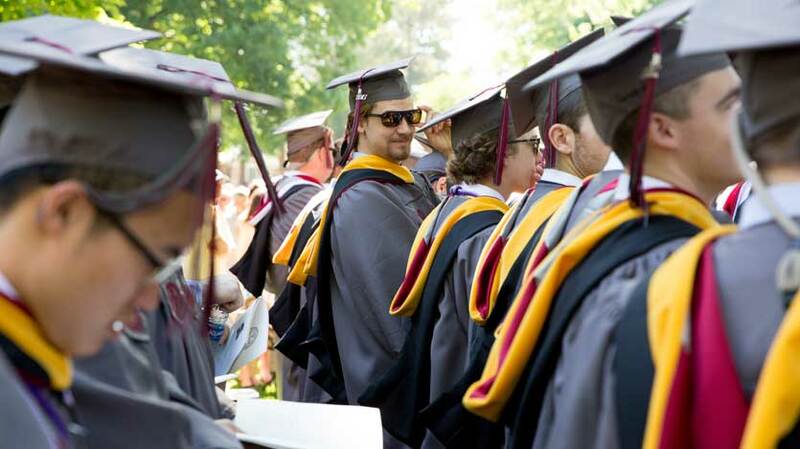 The College honored several students, faculty, and staff as a part of Commencement. Jacob R. Duncan was awarded the Gammon Cup, given to the student-athlete in the graduating class who has best served the College. James A. Mills was presented the Anna Carrington Harrison Award, awarded to the student who shows the most constructive leadership in a school year. 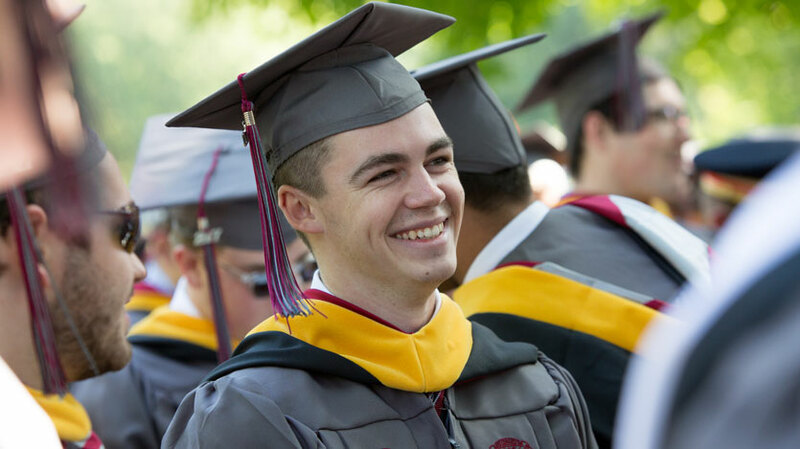 Charles Ashby Neterer was presented the Phi Beta Kappa Award for Intellectual Excellence, given to recognize intellectual excellence as manifested in outstanding student research. Conrad W. Brown and Andrew J. Marshall were awarded the Algernon Sydney Sullivan Medallion, given to members of the graduating class who have demonstrated distinguished character and generous service to his fellows. Dr. James Frusetta, associate professor of history, received the Cabell Award for outstanding classroom teaching. Dr. Mike Wolyniak, Elliott Associate Professor of Biology, received the Thomas Edward Crawley Award, awarded to the professor most distinguished for devoted service to the ideals of Hampden-Sydney and the education of her sons. Dr. James Frusetta and Shawn White, Assistant Dean of Students for Substance Education, were both awarded the Senior Class Award, which is given for their contributions to the College, its students, and the community. The Class of 2017 also presented the College with a check for $3,116 towards a scholarship in honor of Lieutenant Colonel (Ret.) Rucker Snead '81, Director of the Wilson Center for Leadership in the Public Interest. This year, one ROTC cadet was commissioned as an officer in the United States Army. Rear Admiral (Ret.) Frank Rennie administered the Oath of Office as Stewart Reese Lawrence received his Gold Bars. "Seek and accept responsibility, to persevere, to be committed to excellence, to be creative and courageous, to be unrelenting in the pursuit of intellectual development, to maintain high standards of ethics and morality, and to bring these basic principles of existence to bear through active participation in life.'" Following the presentation of awards, Bret Stephens, a columnist for the New York Times and a Pulitzer Prize winning journalist, gave the commencement address. Entitled, "Leave Your Safe Spaces," his speech encouraged graduates to engage in discussions with those who have opposing viewpoints, and to venture outside their intellectual comfort zones. The College awarded an honorary Doctor of Humane Letters to both Mr. Stephens and Nancy Gray, who delivered the Baccalaureate speech, for their contributions to the life of the mind, distinguished service, and strong commitment to public service.President Larry Stimpert closed Commencement with his charge to the graduating class. Quoting the late Admiral Hyman Richover, he told the graduates to "'seek and accept responsibility, to persevere, to be committed to excellence, to be creative and courageous, to be unrelenting in the pursuit of intellectual development, to maintain high standards of ethics and morality, and to bring these basic principles of existence to bear through active participation in life.'"